So many cricketing legends have graced the game, they entertained us and shall always be remembered for their talent and exploits but there is one man still who was absolutely peerless and perhaps shall be remembered like no other. Virender Sehwag. For he revolutionised the art of opening batsmanship in Test cricket; his aggressive approach at the top of the order rubbed off on other openers too and brought about a massive shift in the traditionally conservative mindset and batting style of the openers the world over. He was a phenomenon. He always played with an attacking mindset, looking to score runs all the time. Perhaps no other cricketer could impact the course of a game as much as Sehwag could (and did) in a matter of few overs when he was in his prime. He was a dasher and a master blaster. What is even more significant is that he was never an opening batsman, he had batted in the middle-order right from the start of his cricketing career. But when the Indian team management asked him to open, he didn't bat an eye and grabbed the responsibility with both hands. He didn't have the purest of techniques, he did have a superb hand-eye co-ordination, the gift of timing and fast hands but very rarely did his feet move to the pitch of the ball. Yet he became one of the most successful and destructive opening batsman the game had ever seen because of his self-belief and his clear thinking. Most people believed that his game was cut out only for the one-dayers and not for the test matches. But he proved them all wrong. He was an absolute treat to watch when he was in full flow. The purists always said that to succeed as an opener in test cricket, one needed to have a solid technique and the patience to keep leaving balls outside the off-stump and to start playing shots only when the ball has lost its shine and hardness. Sehwag on the other hand believed that it's easier to score runs when the ball is hard and new. He would always be looking for ways to score runs rather than tiring out the bowlers or seeing them off. Well, he was never intimidated by big names, he always played the balls on their merit and never on the reputation of the bowler. On his day, he could decimate even the best of attacks. What made Sehwag stand out from his peers is that not only did he score those humongous centuries but also almost always scored his runs really fast, often scoring at better-than-run-a-ball even in the test matches! He always kept things uncomplicated. He was very clear in his thinking, and was absolutely fearless of the bowlers. Having an attacking opening batsman like Sehwag at the top of the order had an immediate positive impact on the Indian team's performance. Because when Sehwag got going, so fast became the team's scoring rate that the Indian bowlers got enough time to bowl the opposition teams out. Before he had arrived on the Indian scene, the Indian test team would look out to play for a draw if the target set by the opposition team was stiff. But when Sehwag was in his prime, no target seemed hard enough. One may remember the 387 run chase at Chennai against England in 2008. It was no mean task and the English team were very confident of winning the match. After all, before that match, the highest score that had ever been successfully chased in the fourth innings to win a match in India was 276 that West Indies scored in 1987. The highest successful fourth innings run chase in Chennai was India's 155 against Australia in 2001. Thus records weren't in India's favour. But then records hardly ever mattered to Sehwag. India had only about a session to play on the fourth day and conventional wisdom would have said that the openers would look to play out the overs and look to save the match. 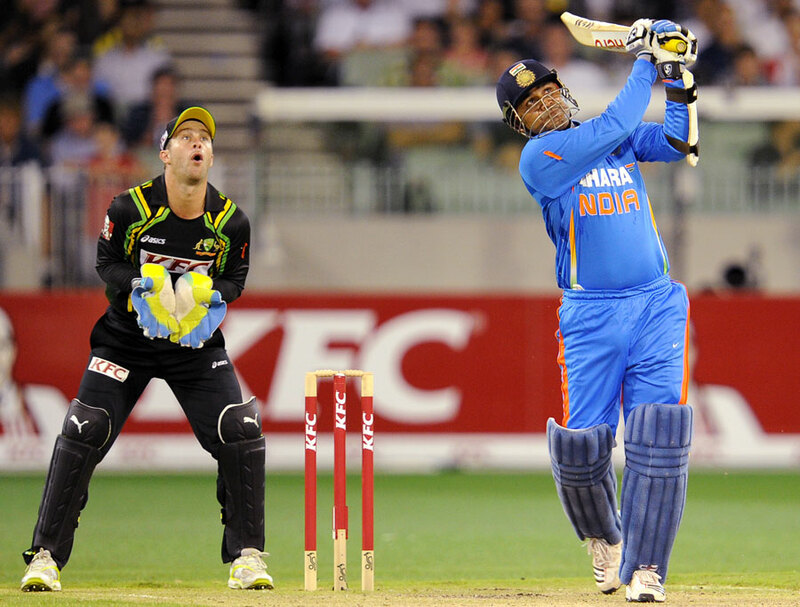 But Sehwag's approach right from the beginning was to score quickly and win the match for India. He took all the bowlers to the cleaners and scored a blistering 83 of 68 balls. Such was the impact of his ferocious batting that by the time, he got out, the English bowling attack had lost its sting. That was Sehwag's speciality. He scored at such a fast clip that it gave the batsmen following him that much breathing space to plan their innings. Some people believed that he was reckless and his knocks were mere flukes, that he had no clear plans. But if one studied him carefully, there was actually a method to his madness. Otherwise he wouldn't have got so many scores above 150! Though he wasn't as consistent with big scores in the ODIs as he was in the test matches but still, even his cameos used to be so ferocious that the opposition bowlers would be left demoralised. His destructive stroke-play always impacted the rhythm of the opposition bowlers, so much that they would forget their lines and lengths, having no clue as to where to bowl to him. With Sachin Tendulkar, he formed a very lethal opening combination in the one-dayers and gave fast starts to the Indian team on several occasions, the primary ones being in 2011 cricket world cup. Not too many cricketers would attempt to go down the pitch to hit a six at the cusp of a century, but Sehwag did just that, quite a number of times. Well he never batted for the records. He always played to a simple mantra - if the ball is to be hit, it should be hit. He often perished for the same mantra as well but never changed his style of batting. He was a pure entertainer, his uninhibited approach to batting is what made him so popular. People loved to buy tickets to go to the stadiums and watch him play. Though after 2011, as age started catching up with his reflexes and eye-sight, Sehwag didn't remain the same force that he once used to be and he last played a test match for India in 2013. Even then, by the time, he hung up his boots, he had ended up with an enviable average of 49.34 in Tests and a commendable 35.05 in the one-dayers. Actually the figures mayn't be able to do complete justice to the impact his stroke-play used to have on a game. He has certainly left behind a legacy that will be difficult to emulate. Thank you Rajeev :) Yeah, I too had doubted if he would ever be able to score big, attacking batsmen often hole out in the deep when going for the big shots but he was intelligent too and he had a tremendous sense of the field placements and so also had nice temperament.